https://www.kulr8.com/news/state/body-of--year-old-missing-in-river-found-musselshell/article_9df9ec79-f0eb-5800-9f1c-17858d36a362.html The 3-year-old was with his 5-year-old sister when he fell in Monday, Lesnik said. The boy is Canadian and was visiting the Kilby Butte Hutterite Colony outside of Roundup with his family.Ice and snowy conditions on the river complicated search efforts, but on Thursday, warmer temperatures — it was 46 degrees Thursday morning — had eased the pressure on search crews, who worked through subzero temperatures and wind earlier in the week, Lesnik said. But the warmth also caused the river levels to rise and made the ice “dicey to work on,” Lesnik said. Personnel from the Yellowstone County Sheriff's office and Roundup's volunteer fire department have been aiding the search. Billings-based US Water Rescue/MT Dive Tech were also on the scene to help search under the ice. Rescuers made several river rescues this week, including two teenagers who crashed their car into Yellowstone River and one man had to be saved in a canal. Thanks to water rescuers, no one was seriously injured. It's a job rescuers say brings an adrenaline rush and is very rewarding. "We're called the U.S. Water Rescue because we actually go beyond the borders of Montana," said Francisco Soto, a member of the U.S. Water Rescue Dive Team. The U.S. Water Rescue Dive Team is a private company that the Sheriff and City Police reach out to in case of a water emergency. "Not all of us get to be police officers. Not all of us get to be firefighters. This is a way for us to be able to do our craft and still help the community," says Soto. The Water Rescue Dive Team is available for rapid response. Assisting the law enforcement is an adrenaline rush. Soto says, "I enjoy it and I think I can speak for most of us. We're all kind of adrenaline junkies. You know, we like that rush and also we get to help." Soto says he is amazed at the situations some people find themselves. "I would just recommend switching on your common sense. If it's pouring down rain or you're getting a lot of rain within the area, obviously the river is going to rise, the waters are going to become swifter, the current will become much quicker," says Soto. "Don't go alone. Always have someone with you and a way to be contacted. Let somebody know where you are going to be." Soto and other divers on the U.S. Water Rescue Dive Team are always learning. These rescues are an opportunity to see how well they performed, and critique what they can improve. Though the high floodwaters are starting to recede, they still cover parts of Houston, the head of a Billings-based water rescue team said Friday. “One of the roads they had us checking yesterday was 16-feet deep,” Shane Weinreis, president of the U.S. Water Rescue Dive Team, said Friday morning. President and dive officer of U.S. Water and Rescue Dive Team Shane Weinreis stands for a photo near gear he plans to take to Houston in Shepherd on Tuesday, August 29. He and other members are going down to Houston to help rescue stranded people and work with a volunteer fire department. Weinreis and two members of the nonprofit organization left for Houston on Tuesday to help where they could. Another team member, who works for the Klein Volunteer Fire Department in the Houston area, told Weinreis that the additional help would be appreciated. They arrived Wednesday and initially, Weinreis and his crew were designated by the Houston Fire Department and FEMA as a special response team for dive emergencies, in case other rescuers got trapped underwater during a rescue. “We were assigned as rescuers for that specific type of scenario since there were not any other dive rescue assets available,” Weinreis said. On Thursday, the team went out with the Texas Ranger Division of the Texas Department of Public Safety to go into neighborhoods and check for possibly stranded people. The Texas Rangers have military vehicles equipped to drive through relatively deep water, Weinreis said, but they didn’t have the specialized equipment, such as dry suits, to be able to wade into contaminated water. To check for the residents, the team broke into the homes. The residents had already left the houses, which were filled with debris, Weinreis said. On the way back, the rescuers checked in on an apartment complex where 30 residents remained. Offered the chance to leave the complex, the residents declined, Weinreis said, deciding to wait it out there. In some areas of town where they traveled, the water had receded, and from the outside the buildings looked deceptively unscathed, aside from the visible waterlines that marked walls at 6 or 8 feet. The damage remains inside. “Some people have already started taking everything out of the buildings to see what they can salvage,” Weinreis said. With rescue operations winding down on Friday in Houston, he and his team were headed to Beaumont, 100 miles east of Houston to see if help was needed there. Asked his impression of the people he’d met, Weinreis said his overall feeling was “they’re very grateful there are so many people that showed up to help. Shane Weinreis and the US Billings Water rescue dive team are on their fourth day in Texas. We continue to follow their rescue efforts as they are the only dive team in the area. Since the Billings US water rescue dive team left for Texas, we have followed them on their journey since day one. The team left Beaumont earlier this morning and are currently in Vidor, Texas. Water is still rising and this video perfectly captures their perseverance and motivation to get through the flood. They are currently based in Vidor's Emergency Operations Center until further notice. The family of a missing Greenfield are reaching both far and near for help in finding Julian Lopez. “We want closure and we need help,” said Lopez’snephew Rene Hernandez. Backin February Hernandez, his brother and Lopez went to a Greenfield bridge to seethe flood swollen Salinas river. As the three watched the murky waters analleged drunk driver plowed through a barricade, hit the three men knockingthem into the raging river. The nephews made it out, but Lopez didn’t. “The day that accident happened the river was in some parts wider than a milenow today the river is less than 20 feet wide in some spots we have a lot ofarea we need to cover and we don't have enough people to check everywhere,”said Hernandez. Wednesday the family brought in a special search team from Montana to help lookfor Lopez's body. “They brought a cadaver dog that's specialized to be on the river and they'researching the river bed doing the best they can for us they've done tremendousjob covered almost 20 miles in two days on the river,” said Hernandez. But the search team leaves Sunday so the family is now organizing a searchparty to look for Lopez on the weekends beginning this Saturday. They've setup a facebook page "Help bring Julian home"hoping to attract an army of volunteers to comb the Salinas river bed. There's a lot of ground to cover and it won't be easy. “There's trees and branches and bamboo. Some spots a little bit ofquicksand but we have to keep looking and we're going to keep looking until wefind him hopefully we get closure soon,” said Hernandez. The family of Julian Lopez has also set up a Gofundme account called “DUIvictims support fund” to help with medical bills and search efforts. So far more than $22,000 have been raised. Emergency crews continued the search Sunday for a 12-year-old girl who went missing while swimming near the Huntley Diversion Dam. Yellowstone County Sheriff Mike Linder said every effort is being made to locate the girl but the search will likely turn into a body recovery. The girl has been missing since about 6 p.m. Saturday. She was swimming with two other people at the head gate and failed to emerge from one of the tunnels that drains into Huntley Project Irrigation District’s canal. Deputies, rural fire personnel and citizens searched the canal “well past dark” Saturday night with U.S. Water Rescue divers and an aircraft aiding in efforts, Linder said. Linder said crews resumed combing the area before 7 a.m. Sunday with the search concentrated on the stretch of canal between the Huntley Diversion Dam and Ballantine where equipment in the canal makes it unlikely anything could float past. However, a small plane followed the canal as far as Pompeys Pillar looking for any sign of the missing swimmer. Irrigation district employees lowered the level of the canal several feet on Saturday to assist divers at the scene but pressure was raised on Sunday to prevent the canal’s banks from collapsing. The canal’s water is murky and divers are dealing with low visibility. Linder said dogs were also brought in and deputies on foot searched every accessible area along the targeted stretch of canal. The dogs hit on a couple places along the canal but the leads proved to be dead ends and searchers can’t be sure the girl was ever at those points. Linder said the divers and dogs have done all they can. Crews remained on scene Sunday night and will focus their attention on a cleanup area near Ballantine with equipment that strains debris from the canal. An airplane could also make another pass through the area on Monday if weather permits. A woman who threatened to jump off a railroad bridge over the Yellowstone River between Billings and Lockwood on Saturday was coaxed away from the ledge by a trio of law enforcement officers. The three-hour drama began just before 1 p.m., when a group of people who were fishing from shore noticed the young woman walking along the railroad trestle, said Lt. Mark Cady of the Billings Police Department. She sat down on a ledge below the main deck, by the second piling of the bridge. The onlookers called 911. Officers from both the BPD and the Yellowstone County Sheriff’s Office responded to the scene, along with the Billings Fire Department and an AMR ambulance. Sheriff's deputy Aaron Harris and police officer Phillip Tanis lay on their stomachs for much of the time, speaking with the distraught woman. They were aided by police officer Del Kuntz, a crisis negotiator, who stood nearby, and a diver with the U.S. Water Rescue who stood on the other side of a girder. In the meantime, a second diver, also with U.S. Rescue, a group of special service officers attached to the sheriff’s office, waited directly below the bridge, next to a raft in the water, as a precaution. At one point, officers brought the woman a bag of food and a drink. Most of the time she leaned against a girder, legs pulled up to her chest. Though temperatures were in the 60s, a steady wind blew. Dark clouds amassed over the area and large drops of rain, mixed with the wind and the dust, fell for about 15 minutes. Vehicles whizzed by on Highway 87, which parallels the railroad bridge, oblivious to the drama that was unfolding nearby. Officers kept people away from the river’s shore, so as not to further agitate the woman, and a nearby bicycle path was blocked off. Finally, around 3:30, the officers dropped a strap down to the woman and encouraged her to grab it. She refused at first, but she eventually heeded their words, pulled on the strap and stood up. The officers helped her back up to the main level of the tracks and covered her with a blanket. Then they helped her walk down a hill to a waiting patrol car. Yellowstone County Sheriff Mike Linder, who also was on scene, praised the teamwork that brought the incident to a good ending. Jim Lewis, chief information officer for Montana Rail Link, said as soon as MRL got word about the woman on the bridge, at 12:55, they began holding up traffic. Altogether three trains were delayed, but by late afternoon, traffic was back to normal. The Yellowstone County Coroner's Office has identified a 13-year-old Billings boy who drowned at Lake Elmo State Park on Thursday as Christian James Wilson-Gartside. Deputy coroner Cliff Mahoney said that Christian died of freshwater drowning. A memorial and fundraising page set up with the website gofundme.com said that Christian recently finished seventh grade at Castle Rock Middle School. "Christian was a fun, witty boy who loved the outdoors and flying airplanes with his papa Clay," the page said. "He enjoyed his time with his friends roller skating and playing baseball. He had the most unconditional love for all of his family." Emergency crews were called out to Lake Elmo on Thursday afternoon after Christian and another boy were swimming at the lake. The other boy told police that he noticed his friend struggling and tried to help but couldn't and swam to shore to get help. Search and rescue crews found Wilson-Gartside body after about an hour of searching. USWRDT made the recovery within about 15 minutes of arrival. We pray for the family and Christian's friends. U.S. Water Rescue Dive Team traveled to Georgia to conduct the Underwater Investigation involving Kelly Nash. Very successful operation. Much support from the family and local law enforcement. Very sad story. We pray for healing for the family. With the recent rash of drownings in Montana, officials and experts are stressing water safety. Over the weekend, two people, an adult and a toddler drowned in separate incidents on the Stillwater River. Rivers like the Stillwater and others under the Big Sky may look deceivingly harmless to the naked eye, but can pose serious dangers. "So right in this area we have several hazards here," said Stillwater Co. Sheriff Clifford Brophy. "If people were to go our with guides or trained professionals, they can learn those few key points there, that will help them minimize the danger out there." Even a shallow river like the Stillwater can produce hundreds of pounds of force. "Just this water appears to be shallow enough people can stand up in it," said Brophy. "In fact, if you tried to, there's a good chance you can get your foot caught in that and literally drown in just a few feet of water." So if you do find yourself in a bad situation, what do you do? Shane Weinreis, a member of the U.S. Water Rescue Dive Team offers suggestions. "Reach, throw, row, don't go," Weinreis said. "The first thing a person from shore would want to do is be able to reach something to the victim, like a oar, or a branch. The next thing would be throw, they have something buoyant, something that floats, if they can throw it to the victim, so they can grab onto that and help support them. And lastly, if there's a boat available then they'd want to use the boat." The rescue team also tells us not to panic, float on your back, and angle your body toward the shore. Officials also urge anyone playing on Montana's waterways have personal floatation device or lifejacket available. "Most crucial point, of course, is fit. If the jacket is too small they're not going to have freedom of movement or the ability to breathe like they would like to," said Oren Harper, another member of the U.S. Water Rescue Dive Team. Is There a Future for Rebreathers in Public Safety Diving? Updated: Jun 07, 2013 6:10 PM MDT Rescuers made several river rescues this week, including two teenagers who crashed their car into Yellowstone River and one man had to be saved in a canal. Thanks to water rescuers, no one was seriously injured. "We're called the U.S. Water Rescue because we actually go beyond the borders of Montana," said Francisco Soto, a member of the U.S. Water Rescue Dive Team. The U.S. Water Rescue Dive Team is a private company that the Sheriff and City Police reach out to in case of a water emergency. "Not all of us get to be police officers. Not all of us get to be firefighters. This is a way for us to be able to do our craft and still help the community," says Soto. The Water Rescue Dive Team is available for rapid response. Assisting the law enforcement is an adrenaline rush. Soto says, "I enjoy it and I think I can speak for most of us. We're all kind of adrenaline junkies. You know, we like that rush and also we get to help." Soto says he is amazed at the situations some people find themselves. "I would just recommend switching on your common sense. If it's pouring down rain or you're getting a lot of rain within the area, obviously the river is going to rise, the waters are going to become swifter, the current will become much quicker," says Soto. "Don't go alone. Always have someone with you and a way to be contacted. Let somebody know where you are going to be." Soto and other divers on the U.S. Water Rescue Dive Team are always learning. These rescues are an opportunity to see how well they performed, and critique what they can improve. Join US Water Rescue Dive Team for TONS-OF-FUN on Sept 17,2011 in Huntley, MT!! We will be having food, music, silent auction, live auction, dunk tank, and lots of fun. This is a fundraising event for the Dive Team that will help with much needed water rescue equipment. JUNE 11, 2011 Dive Rescue Trailer & Boat will be on display at 27 Wicks. Stop by check it out, meet some of the team. MT Dive Tech / US Water Rescue is having a Grand Opening for their new location. Free Food and Door Prizes! Billings Gazette Posted: Sunday, October 24, 2010 4:50 pm |A child’s pink jacket found near an irrigation ditch prompted a search in the Cherry Creek Loop Subdivision Sunday morning, but no body was recovered. A Billings Police Department news release said the department received the report of a possible drowning of a 4-year-old girl at about 10:30 a.m. Officers responded and a Billings Fire Department fireman searched the water and was unable to locate the child. Volunteers of the U.S. Water Rescue conducted an extensive search for 2 1/2 hours while police interviewed witnesses at the trailer court. The search again came up empty. The release said there are no reports of missing children in the area. The identity of the 4-year-old has not been determined. The search has been called off pending new leads. A child’s pink jacket found near an irrigation ditch prompted a search in the Cherry Creek Loop Subdivision Sunday morning, but no body was recovered. A Billings Police Department news release said the department received the report of a possible drowning of a 4-year-old girl at about 10:30 a.m. Officers responded and a Billings Fire Department fireman searched the water and was unable to locate the child. Volunteers of the U.S. Water Rescue conducted an extensive search for 2 1/2 hours while police interviewed witnesses at the trailer court. The search again came up empty. The release said there are no reports of missing children in the area. The identity of the 4-year-old has not been determined. The search has been called off pending new leads. Billings Gazette Posted: Saturday, November 28, 2009 11:15 pm A dive team has searched East Rosebud Lake in Carbon County for a Columbus man who was reported missing at the beginning of the week. Authorities have been scouring the Beartooth Mountains for David K. Krueger, 53, since family members reported him missing Monday evening. Carbon County Undersheriff Dan McJunkin said this week that family members last spoke with Krueger on Nov. 21 and found his pickup truck parked at a trailhead in the East Rosebud Lake parking lot. Initial efforts focused on the Elk Lake area and included search and rescue crews from Carbon and Stillwater coutines, at least two canine teams and an airplane. Billings Gazette Posted: Tuesday, July 21, 2009 11:20 am BASIN, Wyo. - Divers have recovered the body of an Indiana teen who was missing for nearly two weeks after he fell into a roaring mountain creek in the Big Horn Mountains in northern Wyoming. Big Horn County Coroner Del Atwood says the body of 18-year-old Jared Ray Hammack of Orleans, Ind., was found in the Dry Fork of Paint Rock Creek on Sunday. US Water Rescue Dive Team from Billings, Mont., helped recover Hammack. Atwood says Hammack's body was taken to Billings for an autopsy and results aren't expected for several weeks. Big Horn County Sheriff Ken Blackburn says Hammack slipped into the creek while taking a break during a backcountry horse trip. Hammack's body was found about 100 feet from where he fell into the water. Blackburn says divers used weights to hold themselves below the strongest part of the current as they extricated Hammack's body from the rushing water. Billings Gazette Thursday Posted July 16, 2009 The woman whose body was found Wednesday afternoon in the Little Bighorn River has been positively identified as 39-year-old Crystal Williamson-Little Light. The information was released Thursday afternoon by Matthew Pryor, BIA Office of Justice Services special agent in charge. Pryor said forensic testing verified Williamson's identity, adding there were no signs of trauma to the body. Williamson-Little Light of Crow Agency was last seen by her mother in Crow Agency on June 30 as she was leaving with friends to go swimming in the river. After she was reported missing on July 2, officials conducted daily searches of the river.K.T. Irwin of Northwest Canine Search and Recovery of Cody, Wyo., with her cadaver dog Mia, were searching Wednesday about three miles downriver from where officials think Williamson was last seen when Mia alerted searchers. U.S. Water Rescue Dive divers, led by Shane Weinreis, helped to retrieve the woman's body from the river. Crow Fish and Game, Crow fire, Crow police and BIA and FBI special agents assisted in Wednesday's search. The Big Horn County Sheriff's Office also helped in the two-week investigation.A funeral service for Williamson-Little Light will take place 11 a.m. Monday in the Crow Agency Multipurpose Building. Interment will follow in the Crow Agency Cemetery. Billings Gazette Posted: Saturday, June 6, 2009 12:00 am The body of a Billings man who drowned in Nelson Reservoir on Sunday has been recovered. James Root, 58, was found in about 18 feet of water close to where he disappeared while swimming out to retrieve his boat, which had drifted loose from its mooring. According to the Phillips County Sheriff's Office, the body was discovered at about 12:30 p.m. Friday using an underwater camera at the north end of the reservoir. Members of the U.S. Water Rescue Dive Team from Billings retrieved the body. The same area had been searched earlier in the week. Kulr8.com Story Published: Jun 21, 2008 at 6:15 PM MDT s. By Stephanie Domurat BILLINGS - A Billings teen remains missing Saturday after Search and Rescue teams have been looking for almost 24 hours. The Yellowstone County Sheriff's department and U.S. Dive team are currently camped out at the Yellowstone River in the Worden area. They're hoping to find any sign of the 15 year old that disappeared in the river around 6:00 p.m. Friday night. It is a team effort Saturday, looking for a Billings teen who disappeared Friday. "We're searching for a 15 year old boy here in Worden where a boy was swept into the current and not seen again." says Sergeant Kent O'Donnell with the Yellowstone County Sheriff's Department. Police are not releasing a name, but say he is from West High, and described as athletic and a good swimmer. He was last seen by a friend when the two teens were swimming alone in a side channel of the river at Voyagers Rest. "His friend heard him struggling then went around to help, then he disappeared," says O'Donnell. About thirty minutes later police were called to help. Police say the boy's friend had been coming to the area for years, but the missing teen had not. More than thirty people and two boats are involved in the search. "Well were always hopeful, but the conditions of the river aren't to our benefit, theres lot so debris and it makes things harder," says Shane Weinreis of U.S. Dive Team. Officials warn people to avoid the river because of the strong current, and say to stay only in designated swimming areas. "This time of year the Yellowstone River is very dangerous, I ask the public to please stay out of it and go to places like Lake Elmo or swimming pools." says O'Donnell. Because of the muddy waters, crews are searching mostly on the shore. They are covering 12 miles up the river, and along side channels, hoping for any sign of the boy. "We're covering the shorelines and in debris and that's all we can do at this point." Officials say they will continue searching until dark Saturday night, and plan to have search dogs brought in on Sunday. Emergency personnel search for a man presumed drowned at Lake Elmo State Park Thursday evening. A 27-year-old man drowned while swimming in Lake Elmo on Thursday afternoon. The victim was identified as Gregory Williams of Billings, said Kent O'Donnell, a sergeant in the Yellowstone County Sheriff's Office who also serves as a deputy county coroner. A Billings police dive team removed the man's body about 8:30 p.m., more than three hours after friends and family members called 911 to report that he had disappeared while swimming in the northeast part of the lake. He went down about 100 feet from a pavilion where the group had been picnicking. The man had said he would swim out to retreive a raft or inner tube that had drifted from the beach, O'Donnell said. The group saw him go under once and wave his arms, then disappear, he said. The body was found in murky water about 10 feet deep, not far from where the man was last seen, said acting Billings Fire Battalion Chief Les Solheim. Emergency crews began their rescue operation at about 5 p.m. Witnesses said by the time they realized there was trouble, four or five people were on inner tubes and inflatable rafts on the lake. Daniel and Kelly Hood, who had been sitting at a picnic table under a large cottonwood tree at the northeast corner of the lake, heard frantic screams and looked to the water. "They started screaming, 'Call 911!' " Kelly Hood said. She glanced at the group in the water for the first time and noticed one unoccupied inner tube, some distance from the others. Some in the group went diving after the man. "They were diving down and coming up and diving down again," Daniel Hood said. Billings Police Sgt. Casey Hafner said the man appeared to be in trouble while swimming out to the raft. He made it about halfway before turning back, Hafner said, and then he changed course again and went back toward the raft. Someone from the group asked if the man was OK, Hafner said. "He said he was all right, and then he just disappeared," he said, adding that the man had assured members of the group that he was a good swimmer. "It's cool water - hypothermia is an issue," said fire engineer Chris Kuhr, who assisted in the search. There are no lifeguards on duty at Lake Elmo State Park, and people are advised to swim at their own risk. Police divers who also operate U.S. Water Rescue Dive Team, a Billings-based water rescue service, joined Billings firefighters in the search. With fire trucks and emergency vehicles lining Lake Elmo Drive, the divers set up guide lines along the bottom of the lake and swam a grid. 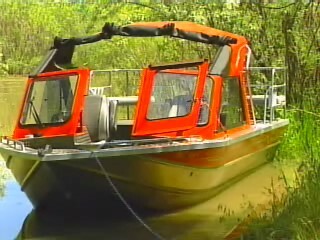 Firefighters in life jackets searched the depths farther out in the lake, and a Montana Department of Fish, Wildlife and Parks boat also assisted. Water in Lake Elmo can be as deep as 20 feet, officials said. Harold Guse, warden captain of enforcement for FWP, said there has not been a drowning at Lake Elmo in the four years he has been stationed at the FWP office here. Billings Gazette Posted: Thursday, October 12, 2006 11:00 The U.S. Water Rescue Dive Team, a nonprofit volunteer organization dedicated to water safety, is currently accepting applications for new members. WHITEFISH - Flathead County divers on Sunday recovered more human remains and personal items belonging to a 14-year-old boy who drowned in Whitefish Lake more than 30 years ago. The search was prompted after a fisherman snagged a sock with human foot bones in it on May 3. Investigators believed the remains could have belonged to David Almos, who drowned in the lake on June 24, 1972 along with Jay Richardson, 15. Richardson's body was found a month later, but searchers couldn't find Almos. On Thursday, divers brought up more remains, including part of a skull, but officials could not link them to Almos, said Deputy Jordan White, one of the divers. On Sunday, with members of the Almos family waiting on the shore, divers returned to the spot where they found more bones, along with a hatchet, a pocket knife, a belt and a pair of glasses. One of Almos' brothers recognized the glasses. "You think about all the emotions and pain our family has gone through for so many years," Travis Almos told KPAX television. "There's never been much of a closure when you don't have a body to bury." In 1982, a fisherman snagged a shoe and a foot that was suspected to belong to Almos, but divers were not able to locate his body. "Many questions regarding the incident preceding the death of these two young men will never be answered," White said in a press release, "but the members of the Flathead County Dive Team are honored to have been part of this recovery and returning David Almos to his family." Copyright © 2005 Associated Press. All rights reserved. This material may not be published, broadcast, rewritten, or redistributed. Billings Gazette Posted: Wednesday, February 9, 2005 11:00 JAMES WOODCOCK/Gazette Staff. Shane Weinreis, dive officer with the Billings Search and Rescue Dive Team, prepares to dive through the ice at Lake Elmo during a training session Wednesday afternoon. Billings Search and Rescue Dive Team member Michael Georgeson signals his team after surfacing in the icy water at Lake Elmo. Preparing to go under an inch and a half of ice covering Lake Elmo Wednesday afternoon, Shane Weinreis was burdened with so much equipment that he needed two other people to help him get ready. Besides his thick thermal underwear and dry suit, he was outfitted with hoses, tubes, ropes, flippers, a compass, a helmet and mask with a built-in microphone and headphones, and a knife and sheath strapped to his ankle. On shore, his assistants were tending air tanks, underwater cameras, life jackets, a television for monitoring live video and a battery-powered receiver for listening to Weinreis when he was under the ice. Weinreis, the dive officer for the Billings Search and Rescue Dive Team, didn't invite the press to Lake Elmo Wednesday just to show off the equipment during one of the team's regular practice sessions. He did so to illustrate how much it takes to field an underwater rescue team. The nine members of the team have purchased all the equipment themselves, Weinreis said, amounting to $25,000 to $30,000, and they are using a borrowed van to store and transport their gear. On top of that, Weinreis said he spends about $2,000 a year maintaining the team's equipment, and all members help pay for insurance, about $500 a year, and for training costs. Those expenses, and the need for new equipment, are behind the first appeal for public support since the team was formed in 1998. "We're growing and we're trying to really maximize our use," he said. Among purchases the team has in mind is a van and a dive control box, for consolidating all the electronic monitoring and communications equipment. Weinreis, who has been the dive officer since the team's inception and a Billings police officer for the past three years, said his group doesn't assist the Billings Search and Rescue with ground operations. "We do a pretty wide variety of training, but it all deals with water, strictly water," he said. 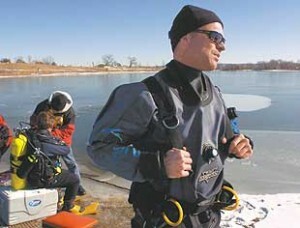 The training session at Lake Elmo in the Heights involved having one diver, Michael Georgeson, pretend to get snagged on something while doing an underwater search, and then having Weinreis, already suited up, go in after him. Georgeson was about 35 feet out from shore when he gave four tugs on a rope, a message to a line tender at water's edge that he needed help. Weinreis, supported by team member Jen Jowe, staggered to the shoreline in his flippers and heavy equipment, waded out into the water and then slowly swam under the ice. All that was visible for a couple of minutes were his bright-green flippers flashing beneath the ice. He found Georgeson's rope and followed it to the end, then helped pull Georgeson to shore. This particular training, fortunately, has never been put to the test since the dive team was formed. Weinreis said the team has never been in any kind of ice search or rescue, but generally gets about four calls a year to look for underwater bodies, cars and guns. The most common call is for swift-water operations on area rivers, and retrieving cars or bodies from irrigation ditches. Whatever they're doing, Georgeson said, the teamwork on display Wednesday is crucial. "We don't go in without a backup plan," he said. "We've always got somebody else ready to go in." Ed Kemmick can be reached at 657-1293. Details Donations to the Billings Search and Rescue Dive Team are tax-deductible. For more information or to make a donation, call dive officer Shane Weinreis. The group's mailing address is P.O. Box 50626, Billings, MT 59105. The most powerful earthquake in 40 years erupted under the Indian Ocean near Sumatra on Dec. 26, 2004. It caused giant, deadly waves to crash ashore in nearly a dozen countries, killing tens of thousands. A long stretch of Sri Lanka's coast was devastated by these killer waves, with more than a 40,000 dead and staggering 2.5 million people displaced. Although 1,600km from the epicentre, the waves struck with huge force and swept inland as far as 5 kilometers. Waves as high as six meters had crashed into coastal villages, sweeping away people, cars and even a train with 1700 passengers. It was the worst human disaster in Sri Lanka history. 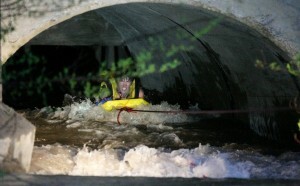 U.S. Water Rescue is assisting in developing a much-needed Water Rescue Team in Sri Lanka. This island nation does not have any trained Water Rescue Personnel, and it does not have the funds needed to develop a team of responders. However, Sri Lanka is surrounded by oceans and the country is criss-crossed by rivers and streams. The nation is plagued by drowning. We are currently working to obtain funding for basic water rescue equipment and basic water rescue training. Please help us in this effort and donate today!